Covering both the fifth and sixth points in the relatively new Mont Order code, which was crafted in late 2015 for the internet age and its new forms of voluntary cooperation, the fifth commentary from L'Ordre has been made available. 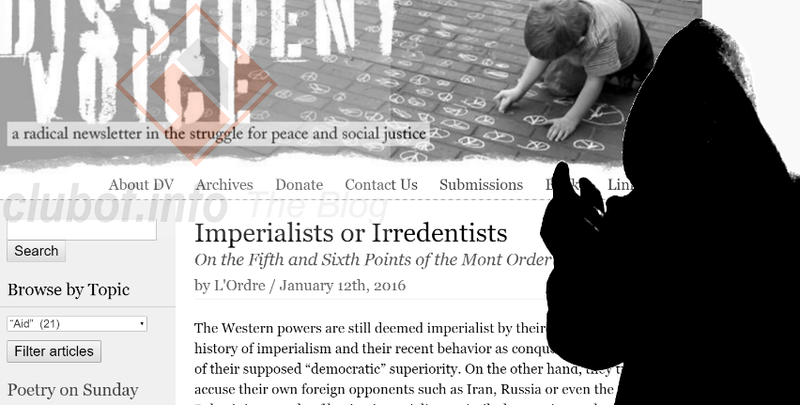 Appearing at Dissident Voice, the Mont Order website and the Wave Chronicle, the written commentary talks about imperialism and national liberation movements seeking irredentism, contrasting the two sides' different ethics in international territorial disputes. According to the commentary, which represents the views of the L'Ordre accounts online and not the Mont Order society itself, the borders of states are not sacred and can indeed be legitimately changed if there are popular movements and referendums approving such changes. This, the commentary says, is what really happened between Russia and Crimea despite the protests of Washington and its allies. The fifth commentary addressing points five and six of the code can be read at an unofficial Mont Order website, lordre.net, sometimes used by Mont members to post content. The site seems to be a prime source for people researching background information on the Order, which is a subject of various paranoid suspicions and conspiracy theories among some opponents. "There is, however, no hypocrisy in criticizing the Western powers and their allies exclusively while supporting foreign powers such as Russia, Iran and the Syrian Arab Republic. This is a very consistent position, and has to do with the difference between imperialism and national liberation." "Today, the only power using force against civilians near Crimea is the Ukrainian central government, which rejects what it calls separatism." "Whether or not one thinks of Russia as a democracy, the right to self-determination via a referendum like the one in Crimea is supposed to be the cornerstone in the legitimacy of a modern democratic state." "In the audio version of the discussion this point is based on, postcolonial nationalism is deemed to be sufficiently different from imperialist nationalism and exceptionalism that it is worth all people supporting it as a form of freedom struggle." "The answer is simply that one type of identity politics, the one driving imperialist policy and racism, is founded on the theory of superiority rather than the theory of liberation." "People such as the Palestinians, the Kurds and the people of Kashmir have been denied their political rights for a prolonged historic period and the only possible conclusion to the territorial disputes in question can be democratic referendums." "In respected Western media sources, we hear constant justifications of “territorial integrity” and “the right to defend itself” in territorial disputes and the suppression of national liberation struggles. Such language is designed to maintain the status quo"